The material herein gives but a glimpse into some of the major aspects of this time ? the temples, the teachings, the Sphinx, the Hall of Records, and the building of the Great Pyramid. With the exception of, " The Story of Ra Ta", which is paraphrased from the readings, all other sections contain direct quotes from the Edgar Cayce readings, giving the number and date of each reading. The complete history of this period, from the Cayce readings, is contained in the publication, EDGAR CAYCE'S EGYPT. This is, undoubtedly, one of the most fascinating and incredible epochs the world has ever known. It has been indicated again and again through these channels that this period of activity of the entity Edgar Cayce is a replica of, or follows closely in the activities of the experience through that called the Egyptian period. It [the Egyptian experience] represents the period through which so many are again attempting to do in realities, physically so, the same as of that period. How can the Egyptian history be completed? ... in the succeeding generations, as thought is turned into those channels, the same will be as that in the beginning; for, as seen, none are being drawn into that purpose of the establishing of this more close relation of God's truth in earth ...other than those that first established same in that land now known as Egypt... in that momentous period in man's understanding. "Let's don't forget the thesis, or the key for which all this understanding had come: that there might be a closer relationship of man to the Creator, and of man to man." Ra Ta entered the earth under unusual circumstances. He was born to a daughter of Zu and "was not begotten of man." Since his mother had no companion, she and her son were rejected by the tribe of Zu. Therefore, Arda, Ra Ta's mother, joined with those in Ararat [Mt. Ararat?]. Though Ra Ta's mother still suffered hardships, Ra Ta grew in grace with these people. Ra Ta foresaw that the people of Ararat should go into a land of plenty that would provide them with all the necessities the world had to offer and where a great spiritual development could take place that would stand for ages to come. Ra Ta prophesied that, Arart, the leader of Ararat would lead them into this land of plenty. Therefore, Ra Ta, at age twenty-one, with his wife and family and a group of nine hundred, directed Arart southward into the land now known as Egypt. There was an easy take-over from the existing king, Raai, who gave over the kingdom to prevent the bloodshed of his people. Eventually, Raai became enamored with one of the incoming people and continued to remain submissive. Ra Ta aided greatly in making for an easy control of this land that supplied them all the luxuries of the earth. However, he was still looked on as strange by many due to his unusual psychic abilities. Arart, who had been the leader of Ararat, became the first northern ruler of Egypt after peaceful arrangements were established. Ra Ta, as the spiritual leader and prophet, began teaching the people about the spiritual nature of man. The natives paid little attention to him until the uncovering of archaeological records. Evidently, he discovered the records through his psychic ability. As a result, more and more attention was given to this peculiar leader. The native Egyptians objected to being taxed without any representation and wanted a say as to how things were run in the government. A scribe was sent to represent their views. This young man-- learned and mystical-- impressed the king. Arart, to appease the Egyptians, gave up the throne in favor of his young son, Araaraart. Araaraart became the second northern ruler of Egypt at age sixteen. Aarat, the clan name given to the native scribe, was elevated to a high position as councilor. Arart, the king who abdicated, and Ra Ta formed an inner council to assure that the ideals for entering this land were upheld. A period of development began when the young king was pitted against the native councilor to see who could do more for the country. Stonecutters gathered materials to build residences for the king's people and other structures. Storehouses for commodities of exchange were built. Araaraart opened mines that produced "?quantities-and quantities-and quantities of gold and silver" and many other metals. There were diamond mines and mines of many precious stones. The native councilor, Aarat, presented to his people the concept that man is the representative of the higher creative forces in the earth. The first tenets were that all time, all space, all force is one. The native Egyptians found it easier to accept these teachings from one of their own rather than from those who had entered. Ra Ta began to select those pointed out to him through his inner guidance that would aid in establishing the temples. He was preparing for the Temple of Sacrifice, similar to hospitals in the present, and the Temple Beautiful, compared to a university. The Temple of Sacrifice was to help cleanse those who still had animal representations in the body such as tails, feathers, scales, hooves, etc. Ra Ta believed these mixtures could be cleansed so they could attain a higher level of consciousness and become contributing members of society. The methods used to complete this transformation to human form were surgery, the changing of thought patterns and activities and the use of diet. When those in the Temple of Sacrifice had been cleansed, they were allowed to enter the Temple Beautiful to study. The Temple Beautiful, representing the body beautiful, was an educational center. Using vocational guidance, people were trained in ways for which they were best suited, such as in sciences, arts, teaching, politics, ministry, etc. Education was for service to God and country. Spiritual truths and cosmic laws were part of the curriculum, always relating to the thesis upon which everything was based: To know more of one's relationship to the Creative Forces or God, and the manner in which this could be expressed in relationships with others. After Ra Ta had set up the practices in the temples, and assigned the work to those he trusted, he began to travel. The priest spent much of his time in keeping in contact with other lands as to their spiritual understanding and progress, especially in Poseidia and Og [Atlantis] and in other lands. Many thought these absences left too much responsibility to subordinates. Gradually the practices in the sacrificial temple became corrupted. There began the brewing and concocting of drinks that set the fires of the body and mind against that as had been set by the priest. When Ra Ta returned from one of his visits to the mount where archaeological research was being done, he found the temples defiled. And as the readings put it, "A mighty turmoil arose." During RaTa's travels, he found that monogamy was practiced in other lands. In Egypt, various companionships were appointed by the ruler. Ra Ta attempted to change this by setting monogamy as the law of the land. Those who wished to be rid of this priest, devised a plot to deceive him. They knew he was trying to purify the bodies in the Temple of Sacrifice. Therefore, they presented him with the idea that if he would sire offspring by women who had the most perfect forms, this would produce more and more pure bodies. It is stated that Ra Ta believed all, trusted all and "fell for the whole proposition." To accomplish their plan of deceit, they approached Isris, a beautiful temple dancer and a favorite of the king. She must seduce the priest or they would harm her people. Eventually, during the course of their activities in the Temple of Sacrifice, Ra Ta and Isris were brought closer together. When an offspring was produced from this union, the cry went up that the priest had broken his law of monogamy since Ra Ta had a wife, Asua, when he entered Egypt. Lines were drawn and sides were taken--this was the first break between Church and State. Eventually, with this tumult, a trial was held and Ra Ta and Isris were banished into the Nubian land [now Sudan] to the south and east of Egypt. Two hundred and thirty one people followed them into exile. Their baby girl, named Iso, was perfect in every way--just as the priest had expected. The infant was taken from her parents and kept in Egypt. Though a caretaker was appointed to see after her physical needs, without the emotional support of her parents, the child wasted away around four to five years of age. Interestingly, from the spirit realm, Iso remained an influence on her mother. The Nubians were a warlike people and were suspicious of this group coming into their land. However, with the entrance of Ra Ta and his people, conditions were bettered in every way for these people. As Ra Ta entered more and more into closer relationships with Creative Forces, greater were his abilities to make this manifest. Thus, peace was enjoyed not only by Ra Ta's people but by all those of that land. The priest began to teach the people the reckoning of longitude and latitude and the activities of the planets and various stars and constellations. He taught the effect these have upon human life and upon every form of expression on the planet. Thus, he taught planting in various phases of the moon, the tides and their effect, the combining of elements in the mineral, vegetable, and animal kingdoms. Ra Ta was the first to be conscious of these things and the Nubians were the first to receive this knowledge. Evidently, Ra Ta and his followers continued their work in other lands as well, since Abyssinia and Libya are also mentioned in connection with the banishment. There was much dissension concerning the exile of the priest. Many sought for his return. Emissaries were sent back and forth to keep in touch with what was happening with the priest and his group. The Atlantean attempt at a take-over after the last sinking of Atlantis. Many Atlanteans were entering Egypt at this time. They brought with them those they called "things" or automatons--those with animal appendages that were kept as laborers to do menial tasks. These were to be exploited rather than to be given the opportunity to improve themselves. Ra Ta's plan was to cleanse these mixtures so they could be equal with others and gain spiritual understanding. Some of the more aggressive Atlanteans planned to gather all those in Egypt with appendages and to put them with their "things", in direct opposition to the teachings of the priest. This being more than the people could take, they demanded the return of the priest. The priest was recalled to Egypt. But before returning, Ra Ta marked those who were in close association with him. To some the marks would be in the eye, to some in the body, or upon the body in various ways. These were to remain throughout their future lives. The purpose of the marks was to quicken the individuals to the purpose they had set when they are drawn together as a group for a particular endeavor [as those involved in the work of Edgar Cayce in the present]. Later, all in that period who had set a purpose were marked. For the return, the Atlanteans prepared gas driven chariots for Ra Ta and his family. The followers returned on animals. On their arrival, Ra Ta and his group were greeted by the faithful and the king's own guard. There was a gala reception and much rejoicing. Due to the strain of the exile, Ra Ta had become decrepit and weak. Though he was now over one hundred years old, it was not uncommon for people to live several hundred years ? even up to a thousand. It was feared he would not live to continue his work. Therefore, Ra Ta withdrew into the Temple Beautiful to regenerate his body. The regeneration or rejuvenation process recreated the body in its elemental forces. This was accomplished in greater part by a musician, Oum-Teck-Pt. He used reed and stringed instruments of the day and the sounding of vowels in such a way as to arouse the centers through which there is the connection of the spiritual forces to the sensory system. When this process was completed (after some six and one half years), the priest was revitalized and able to continue his mission. He was then called Ra. After the priest's rejuvenation, differences were laid aside. Peace was established with the Atlanteans. The various groups and factions worked together for the good of the whole. There began a great development in Egypt. Homes and families gradually grew much as in the present but with more than one companion. Where there had been only forts or temples in various sections of the country, there emerged communities, towns, and cities with their own rule, similar to those in our own land. With these divisions, rather than dividing the country, it centralized the interests of the whole. This began the first national spirit of a people. The Temple Beautiful reopened after twenty years. Decorations in the temple became more elaborate as did dress and ornamentation. These were with the supervision of Isis and with the spiritual influence of Iso, (the child who had died). Isis (formerly Isris, the priest's companion) was elevated to the position as the first goddess of Egypt to show the importance of woman in human affairs. Women were on an equal par with men in national, local, and individual relationships. Egypt became known as a scientific, cultural and spiritual center. The Atlanteans brought much in the way of culture and scientific advancements to Egypt. They aided in the construction of the Great Pyramid. The great teachers of the world were called into Egypt to correlate their understandings of the Law of One God. They unified the teachings of the world. (This period became the foundation of the Master's teachings.) Emissaries were sent to many lands to spread the truths. Work on the Sphinx resumed. The Sphinx was later set as the sentinel or guard of the records. A chamber at the right paw of the Sphinx leads to the Hall of Records which lies between the Sphinx and the river. The Atlantean records and many from the Egyptians are stored there?to be opened when much of the selfish motives in the world are broken up and the fifth root race begins. There began the preparation for that later called the Great Pyramid. This was to be the presentation of that which had been gained through the activities of Ra Ta, now known as Ra. These understandings were to be preserved for the generations to come and until the change in the earth's position (the shifting of the poles). Isis served as the advisor. This was to show the advancement of woman in her position in the activities of the human race. The civil and political authorities began to question Ra's manner of producing pure forms in the Temple of Sacrifice. This was disturbing to Ra. When all the pyramid or memorial was complete, he felt his mission had been accomplished. It was then that Ra ascended into the mount and was borne away. After the priest's demise, disputes arose concerning his methods of the preparation of bodies in the Temple of Sacrifice. Gradually a spiritual decline followed due to the lack of supervision of the activities of the emissaries in their relations with other lands. They also lost hold of the spiritual concept (the ideal) by the worship of individual things (materialism) rather than the spiritual. Though Ra Ta may have rushed the process of evolution in trying to cleanse the race of contaminations, his purpose to help mankind cannot be questioned. As stated in his readings, he did the best he understood at the time. The Hall of Records which contains information for the enlightenment of future generations? 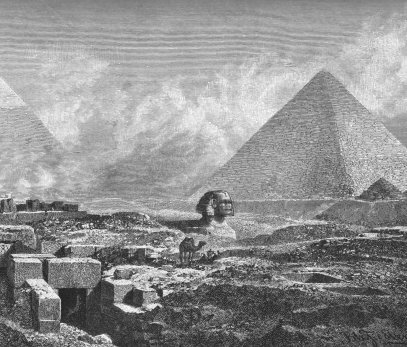 The Great Pyramid with prophesies built in stone? The correlations of truths which became the foundation of the Master's teachings, 10,500 years later. Ra Ta had unusual psychic abilities-- he expressed this with psychic archaeology and prophecy and in many ways. Edgar Cayce certainly had unusual psychic powers which he used to aid others, mentally, physically and spiritually through his readings. Ra Ta established a hospital (the Temple of Sacrifice) to heal those who had little hope. Edgar Cayce established a hospital and about two-thirds of his readings deal with information intended to alleviate the suffering of others. Ra Ta's whole program was based on seeking a relationship with God and expressing this in relationships with others. Edgar Cayce's readings deal with the same principles. The "Search for God" material may well be the same as the teachings of Ra Ta, presented in a different manner?check it out. "?this priest [Ra Ta] may develop himself to be in that position, to be in the capacity of a liberator of the world in its relationships to individuals in those periods to come; for he must enter again at that period, or in 1998." The entity then was among those who aided, who assisted those who would of themselves purify their bodies in the Temple of Sacrifice and prepare themselves in body and mind in the Temple Beautiful for service in the activities to make known those awarenesses of the sons of the Law of One--or God is one. Those temples were on the order of what we today call our educational institutions and hospitals, that prepared the men and women of that period for a greater service to their country and to their people--for the glory of the Creative Forces, or God. The passage of individuals (to be sure, by choice) through the experiences in the Temple of Sacrifice was much as would be in the hospitalization, or a hospital of the present day--when there have become antagonistic conditions within the physical body, such as to produce tumors, wens [cysts], warts or such. Magnify this into the disturbances which were indicated, or illustrated in conditions where there was the body or figure of the horse, or the head of the horse with the body of man; or where there were the various conditions indicated in the expressions by the pushing of spirit into physical matter until it became influenced by or subject to same. Such influences we see in the present manifested as habits, or the habit-forming conditions. ...the Temple of Sacrifice; sacrificing self that the spirit, the purpose, the love of God might be made manifest through the individual. For, in the period, there was the Temple of Sacrifice ; or that wherein the body was shed of the animal representations through the sacrificing of the desires of the appetite, through the changing of self in the temple service. In structure, this: There had been gathered from all the nations of the earth that which represented from their environ, their surrounding, the most beautiful gift; that it might be a reminder of those, to those, that purified or gave themselves in service or activity there, of the beauty of service of every land in this preparation of the bodies for their greater service as well as enabling the servants, the workers, the priestess, the prophetess, those that labored--or joyously gave themselves--to give their activity for others. The materials outwardly were of the mountains nigh unto the upper waters of the Nile. It was in the form of the pyramid, within which was the globe--which represented to those who served there a service to the world. The furnishings may be surmised from the fact that the most beautiful things from each land were gathered there; gold, silver, onyx, iron, brass, silk, satins, linen. What were the symbols of the seven stages of man's development? Here it may be well that there be given a concept of what is meant by the journey [through the temple], or what journey is meant. As indicated, it, the globe within the pyramid without, was four forty and four cubits (twenty-seven and one-half inches was a cubit then, or a mir then). [The pronunciation was myrrh.] The height was four and twenty and forty and four mir, making then that in the form of the ova, or the egg in its ovate form. From station to station in the seven phases or seals or stands or places of the activities, they were such as to make each station lead from one to another by ever crossing the one; making the continued web. ...vocational guidance [was practiced] in which there might be a better united effort on the part of all to fill that part in material experience in which they were especially fitted through nature or natural sources. ...in the Temple Beautiful, or that which had to do with the mind's unfoldment to the cosmic, to the spiritual laws, of those who were prepared or purified there for their service in the varied relationships of economic, social, commercial, material and scientific application in the varied groups. ...the entity was among those who were purified in the Temple Beautiful, who were edified, as to how administrations to others were to be not by some great deed but in the patience, the gentleness, the kindness, the soft word that will turn away wrath. ...in the Temple Beautiful ...that place of service and activity in which there were the trainings as it were of the individuals, from the desires of the natures of flesh itself, purified by service and activity, through rote--yet... raised within the bodies... the fires of purification [raising of the spiritual energy within]. ...the fires for the purifications in the body and in the mind (called the fires in the present, but were the activities of individuals); hence dealing more with the moral relationships with groups and individuals. What part of the service in the temple might be applied or used beneficially now? Purifying of self, in body and in mind. ... [one who] aided in the temple service, as also in the distribution of those tenets as were gained much through the music of the period that aided individuals in raising in themselves that which would make for a unity of purpose with the Creative Forces that overcomes the material and the carnal forces in man. This was at a time when, as set by the priest, the women and the men were on an equal par in their services in the political and in the religious service and rites of the people. ...material aids for dis-ease ...the dance and the music in the temple, ...those still may be applied to the healings of individuals in their distresses or disorders in their lives. ...among those that supplied music in the Temple Beautiful, as well as in the dance-or in the activities of the body to bring to the consciousness of individuals the change being wrought in the mental being, as physical change was wrought in the body, during temple service. ...dances were established in that temple for the exercise of body, for the rhythm in presenting the ideal activities through the sphere of relationship of Creative Forces to man's interpreting of same in body and mind. ...in the activities in the Temple Beautiful ...there were the body movements, as of the dance and as of song. .. a part of the ritualistic work of those preparing themselves through that activity. ...there was the using of music as the means for the rhythm of the body in service ...used to arouse the emotions of the body not for carnal reactions but the spiritual; as the dance that would unify the activities of individuals with the harmonies of life. ... among those who wrote the songs in that period, that were chanted and sung in the temples. ...the entity's songs were chosen above those of others; giving much to the peoples in that period of the understanding of the relationships of individual to individual, of individual to the Creative Forces as may be manifested in various forms in materialness. ... among the daughters of Ra Ta, active in the developing of the songs... in the Temple Beautiful. ... [she] was a musician upon the lyre as well as the conductor of the music in the temple worship... to arouse the activities of the peoples. The entity ...was active in preparing the interior decorations for the halls [in the Temple Beautiful]. Those were applied in such manners as to lend to the activities a contributing factor to the intents of the individuals as they prepared themselves for varied offices, both in political and social, both economic and religious, and all the forms of activity. ...among those who decorated the walls, the altars, the seats of those who ruled, the seats of those who ministered to the spiritual needs, the mental welfare of the peoples in the land [and] brought to many an understanding of how those things of the eye...influence and affect the bodies of those who look upon those things that influence the lives ...in the decorative arts. [in the Temple Beautiful] there was the giving by the prophetess of the seal of life that was set upon each and every one who passed through these experiences, how or in what field of activity the relationships were of an individual to its fellow man in maintaining material existence; being in the world yet not of the world. 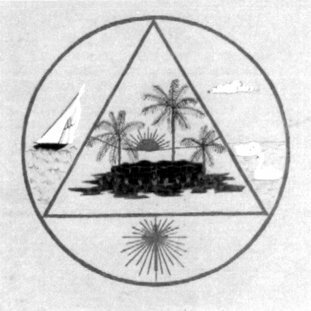 [life seals]... the emblems that indicated that necessary to be held within self for a revealing of self from within; in the signs, the plaques, the emblems that were given through the drawings. ...in those days when the learning of the land turned to the study of the relation of man to the Creator. ...there was the absorbing of the ideals and ideas of the priest [Ra Ta], or the turning of the ideas into ideals, through the seeking to comprehend, to understand, and then to practically apply the tenets of "The Lord thy God is One." Let's don't forget the thesis, or the key for which all of this understanding had come: that there might be a closer relationship of man to the Creator, and of man to man. ...knowing and applying that truth--that first there must be lived within self that as would be the lesson taught to others. ...establishing of those activities which were being fostered by the priest for the regenerating of the people's lives through their manners of living, their manners of conduct, their manners of exercise, their manners of diet and the thought of such natures. As ye would have another be, that be thyself. For God is not mocked, and whatsoever a person soweth, that must he reap. These make for that in the experience of each soul that makes life, with all of its uprisings and downsittings, worthwhile. ...as was given by the Law of One during that sojourn, and as is the experience in the present, God is within--and the manifestations of His love and His mercy in and among his fellow man may be best known by the acts, the deeds--yea, even the very thoughts of man as in relationships to his fellow man. [The ideal as expressed in Egypt]: To know more of man's relationship to the creative influences, or God, and the MANNER in which he may manifest same in his relationships to his fellow man. How can I come to know and understand the light in the teaching of this period? ...this particular period became that that was the foundation of that taught by the Master. How may I better fit myself to aid in this work, which is so influenced by this Egyptian period? In drawing nearer and nearer to that mind as was in Him who crystallized the experiences of the period in the earth ten thousand five hundred years later. ...the tenets taught at that time ...were the foundations of that known as the Christian era. In this experience we find those tenets as were set in motion by that experience may be made compatible with that gained by the association with the Master, for they be one--even as has been given, they were the foundation of that as taught by the Master in His experience in the earth's period. What is the significance of the character of the figure of the Sphinx... ? ... When there was the entrance of Arart and Araaraart [who became kings], they begin to build upon those mounds which were discovered through research. With the storehouse, or record house (where the records are still to be uncovered), there is a chamber or passage from the right forepaw to this entrance of the record chamber, or record tomb. This may not be entered without an understanding, for those that were left as guards may not be passed until after a period of their regeneration in the mount, or the fifth root race begins. ...the Mystery of Mysteries [the Sphinx], this was intended to be a memorial ...to that counselor [Asriaio]...this was later-by Isis ...turned so as to present to those peoples in that land the relationships of man and the animal or carnal world with those changes that fade or fall away in their various effect. These may be seen in a different manner presented in many of the various sphinxes ...as the lion with the man, the various forms of wing, or characterizations in their various developments. These were as presentations of those projections that had been handed down in their various developments of that which becomes man-as in the present. ...the memorial standing as the mystery of the ages today [the Sphinx] ...represents this counselor [Asriaio] to the kings... The face, even as was given then, is the representation of this counselor to this great people. These, and many findings ...may be found in the base of the left forearm, or leg, of the prostrate beast, in the base of foundation. Not in the underground channel (as was opened by the ruler many years, centuries, later), but in the real base, or that as would be termed in the present parlance as the cornerstone. In what capacity did this entity act regarding the building of the Sphinx? As the monuments were being rebuilt in the plains ...this entity [Arsrha] builded, laid, the foundations; ...figured out the geometrical position of same in relation to those buildings as were put up of that connecting the Sphinx. ...The base of the Sphinx was laid out in channels, and in the corner facing the Gizeh [the Great Pyramid] may be found the wording of how this was founded, giving the history of the first invading ruler and the ascension of Araaraart to that position. Give in detail what the sealed room [of Atlantean records] contains. A record of Atlantis from the beginnings of those periods when the Spirit took form or began the encasements in that land, and the developments of the peoples throughout their sojourn, with the record of the first destruction and the changes that took place in the land, with the record of the sojournings of the peoples to the varied activities in other lands, and a record of the meetings of all the nations or lands for the activities in the destructions [of the prehistoric animals] that became necessary, with the final destruction of Atlantis and the buildings of the pyramid of initiation, with who, what, where, would come the opening of the records that are as copies from the sunken Atlantis; for with the change it must rise (the temple) again. This in position lies, as-the sun rises from the waters, the line of the shadow (or light) falls between the paws of the Sphinx, that was later set as the sentinel or guard, and which may not be entered from the connecting chambers from the Sphinx's paw (right paw) until the time has been fulfilled when the changes must be active in this sphere of man's experience. Who will uncover the history of the past in record form which [is] said to be near the Sphinx in Egypt? As was set in the records of the Law of One in Atlantis, that there would come three that would make of the perfect way of life... Those, then, that make themselves that channel. For, as He has given, who is to proclaim is not mine to give, but they that have made of themselves such a measure of their experiences as to be worthy of proclaiming. Where are those records or tablets [thirty-two plates] made of that Egyptian experience, which I might study? How may I now find those records, or should I wait-or must I wait? You will find the records by that channel as indicated, as these may be obtained mentally. [These were her personal records which she could have "obtained mentally" and which Cayce encouraged her to do but this did not happen.] As for the physical records [of the Atlanteans and others]--it will be necessary to wait until the full time has come for the breaking up of much that has been in the nature of selfish motives in the world. For, remember, these records were made from the angle of world movements. In the information as respecting the pyramids, their purpose in the experience of the peoples, in the period when there was the rebuilding of the priest [Ra Ta] during the return [from nine years in exile] in the land, some 10,500 before the coming of the Christ into the land, there was first that attempt to restore and add to that which had been begun on what is called the Sphinx, and the treasure or storehouse facing same, between this and the Nile, in which those records were kept by Arart and Araaraart in the period. Then, with Hermes and Ra (those that assumed or took up the work of Araaraart) there began the building of that now called Gizeh [the Great Pyramid], with which those prophecies that had been in the Temple of Records and the Temple Beautiful were builded, in the building of this that was to be the hall of the initiates of that sometimes referred to as the White Brotherhood. This, then, receives all the records from the beginnings of that given by the priest, Arart, Araaraart and Ra, to that period when there is to be the change in the earth's position and the return of the Great Initiate to that and other lands for the folding up of those prophecies that are depicted there. All the changes that came in the religious thought in the world are shown there, in the variations in which the passage through same is reached, from the base to the top-or to the open tomb and the top. These are signified by both the layer and the color in what direction the turn is made. In this same pyramid did the Great Initiate, the Master, take those last of the Brotherhood degrees with John, the forerunner of Him at that place, ["John first went to Egypt-where Jesus joined him and both became the initiates in the pyramid or temple there." 2067-11] As is indicated in that period where the entrance is shown to be in that land that was set apart, as that promised to that peculiar peoples, as were rejected-as is shown in that portion when there is the turning back from the raising up of Xerxes as the deliverer from an unknown tongue or land, and again is there seen that this occurs in the entrance of the Messiah in this period-1998. When the lines about the earth are considered from the mathematical precisions, it will be found that the center is nigh unto where the Great Pyramid, which was begun then, is still located. What was the date of the actual beginning and ending of the construction of the Great Pyramid? Was one hundred years in construction. Begun and completed in the period of Araaraart's time, with Hermes and Ra. What was the date B. C. of that period? 10,490 to 10,390 before the Prince entered into Egypt. How was this particular Great Pyramid of Gizeh built? By the use of those forces in nature as make for iron to swim. Stone floats in the air in the same manner. This will be discovered in ?58. How was this begun? Who was given that this should be a record of man's experiences in this root race? for that is the period covered by the prophecies in the pyramid. This was given to Ra and Hermes in that period during the reign of Araaraart when there were many who sought to bring to man a better understanding of the close relationship between the Creative Forces and that created, between man and man, and man and his Maker. Carol Hicks provided the format and artistic enhancements to the original print version. Thanks to Carol for her time and effort. Jonathan Eagle prepared the web version of the article for posting. Many thanks to Jonathan for his expertise.